Aspen's Eight Babies! A photo-chronicle! 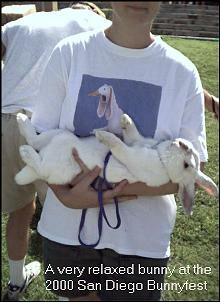 One of the great discoveries I have made in the past 5 or so years is what a great pet rabbits make. Previously, I had never known much about rabbits; I would see them in pet stores and think that they are cute, but never thought of them as pets. After I read up on them and talked to the fine people at Brambley Hedge Rabbit Rescue, I got a chance to see the gentle, inquisitive nature of rabbits. Needless to say, I am hooked on them. First and foremost, rabbits make great house pets. It's such a mistake (and more than a little cruel) to keep rabbits locked up in a hutch in the yard or a spare room. In fact, the heat of even an average summer day can be lethal to them (don't even ask about the blistering Phoenix summers). 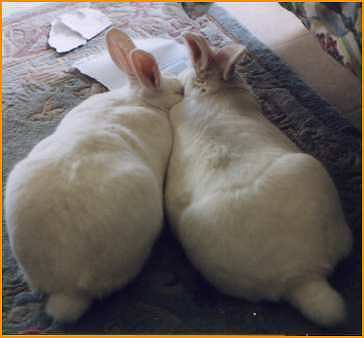 Rabbits are by nature social creatures, and love to be around people and other family pets. They can be litterbox-trained, and they reach their full potential when they can roam the house like a dog or a cat. And above all, they seem to be such happy creatures, and their enjoyment of life can be very infectious. Rabbits are classified as 'lagomorphs' and are also called 'lapines'. They are not rodents as many people mistakenly believe, possibly from the appearance of their front incisor teeth. These teeth grow constantly throughout their lives, and that makes rabbits chewing machines. They must chew things to keep their teeth healthy, and new rabbit owners must be aware of and accept this critical fact, and take appropriate action. You could not train a rabbit to NOT chew any more than you could train a cat not to meow, or a bird not to fly. - BUNS - This is a picture of my first rabbit, Buns, and what an extraordinary rabbit he was. A house bunny, he had the run of the house 24 hours a day. He was litterbox trained and very fastidious in his habits. When I got Buns I also had two cats, J.R. and Eunice. I was a little wary at first, because I thought the cats would go after the rabbit and hurt him. My fears turned out to be groundless as Buns quickly established himself as a force to be reckoned with, and took to pushing both of the cats around. A shy, retiring, timid bunny he was not. Buns loved to stretch out in the middle of the hallway and relax, kicking his back feet out in back of him. He loved to be petted, and would often jump into bed with me in the morning and put his head under my hand. His normal sleeping area was on the bed in the guest room. Being very social, he never minded when I had (human) guests. He would jump up into bed with them in the mornings. Buns was very partial to graham crackers and grapes. 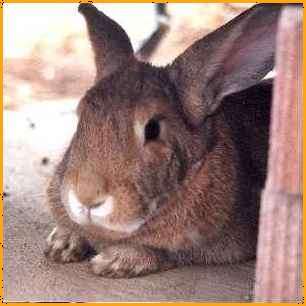 Buns died in January of 1999 from a condition called gastro-intestinal (GI) stasis, also known as ileitis. This is when their digestive system stops functioning. Rabbits have a very delicate digestive system and ileitis is an insidious, silent killer with not many obvious symptoms. 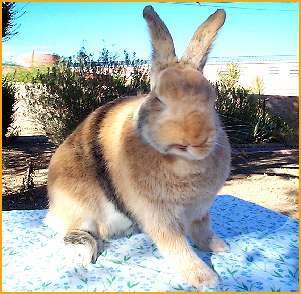 Coupled with the naturally stoic demeanor of rabbits, ileitis can go undiagnosed until it is too late. Sadly, that is what happened to Buns. He died in the veterinarian's office while I was at work. I will always remember him hopping joyfully around the backyard on warm spring mornings. He died much too soon; I still think about him and miss him to this day. 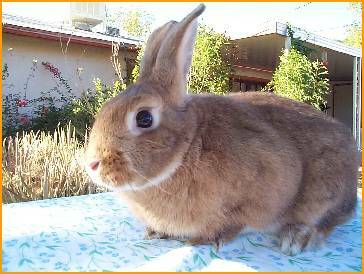 - CISCO - I adopted my next rabbit, Francisco, because when I first encountered him he was so lively and full of personality. He was a real character, running around the room getting into mischief and jumping up on my lap. Also known as 'Cisco' or the 'Black Rabbit of Inle' (for all you Watership Down buffs), he has become quite a handful - headstrong and stubborn with flashes of temper, grunting and snorting when displeased (although you would not infer that from this picture of the camera-shy Cisco)! In particular Cisco loves to terrorize guests and strangers, who more often than not don't know how to handle an aggressive, noisy bunny. Always energetic and full of life, Cisco can be very charming and amusing - but on his terms only. - TEDDY - Two more rabbits have found their way into my home and heart. 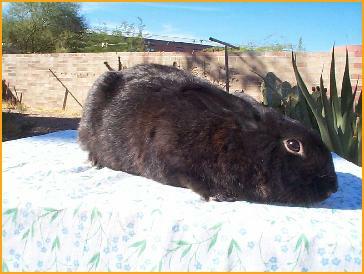 Teddy is a harlequin rabbit with very unusual black stripes running around his midsection. I call them his "racing stripes". Teddy came to me from a local shelter as a foster rabbit with broken and damaged front teeth. The minute I saw him and held him I knew he had already gone from a foster rabbit to an adopted rabbit. Teddy is my "problem child", getting into mischief and doing all the bad things he knows he shouldn't do. Mainly because of him I got the floors in my house tiled, because he steadfastly refused to stop ripping up the carpeting (it turned out that tiling my floors was one of the best things I've ever done! Teddy was right after all). He also encouraged me to get rid of all the old wallpaper around here, since he delighted in tearing it off the wall in large strips with his chisel-shaped teeth. But Teddy is so sweet and good natured it's impossible to be angry with him. Right before I took this picture, Teddy was looking as cute and adorable as he could possibly be. A split-second before I tripped the shutter he scrunched up his face. I just missed by a couple of milliseconds getting him sticking his tongue completely out. Teddy jumps up into bed with me each and every morning and puts his head under my hand to be petted. He cannot get enough petting. You could pet him for an hour and if you stop from exhaustion, he will turn to look at you as if to say, "You can't be stopping so soon!" He is an absolutely lovable bunny. In the summer of 2003 while at a routine checkup, my veterinarian told me Teddy's heartbeat didn't sound quite right - muffled and obstructed. An ultrasound revealed a large tumor or absess growing right up against the right side of his heart. The vet told me surgery or any kind of invasive treatment was not an option, and the best we could do was to just let nature take its course. Teddy continued living his life with great joy and while the only indication something was not right with him was his eyeballs occasionally bulging out, I knew any time I had left with him was borrowed time. Our time together ran out on the morning of January 2, 2004 when I went to give Teddy some banana pieces and found him in distress, his lips blue and mouth wet from drool. He died in my arms 30 seconds later. Thankfully it was extremely fast with a minimum of suffering (on his part). I will miss his gentle, wonderful, beautiful soul, his perpetual cheerfulness, his loving demeanor, and his soft silky fur. Rest in peace, my beautiful Teddy. - SOPHIA - This is a picture of the very sweet and photogenic Sophia. Sophie made her debut at the local shelter by giving birth to 5 baby bunnies in her cage one August Sunday afternoon. I have no idea of her exact age but I think she was bred at a very early age; her name was "Mama" when she was turned in. I got her spayed when I adopted her, so her litter-bearing days are over. A beautiful little Rex mix with gorgeous eyes, Sophie has absolutely perfect features. As she has gotten older her fur has darkened in color from a medium orange-tan to a darker chestnut brown. She was a little shy when I got her but she has come around spendidly, and enjoys very much her run-time in the house. Her favorite food is carrot greens, and she often stuffs her mouth with them, and looks really funny with a huge bunch of carrot greens hanging out of her mouth while she contentedly munches on them. She loves to be brushed, which I try to do two or three times a week. While not as comical and social as Teddy, or as in-your-face as psycho-bunny Cisco, Sophie is very gentle and lovable, and is a joy to have around. Sometime during the early morning hours of Monday December 6 2004 my Sophie left me and went to the Rainbow Bridge. It was completely unexpected as she had shown no symptoms of illness at all. I am completely mystified as to why she left and will probably never know. Sophie was one of the sweetest, most gentle rabbits I have ever known. She had never shown the slightest hint of aggressive behavior, even when she was getting her yearly check-up at the vet and was being poked and prodded by strangers. There was such an air of grace and delicacy about her - she was just extremely sweet-natured and never complained about anything. I miss her very much already. Is there anything better than Bunnylove?